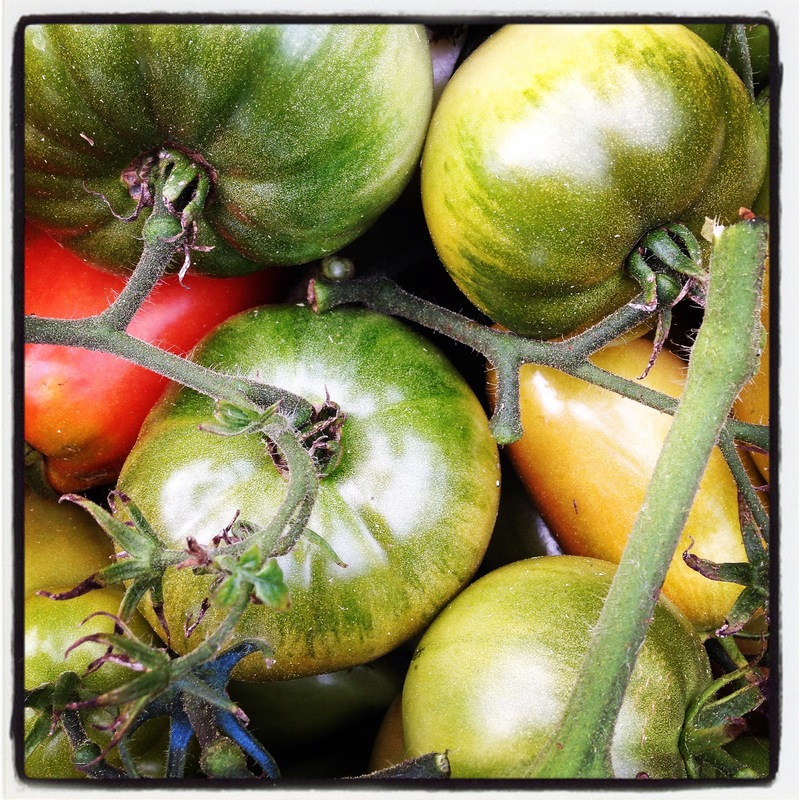 What would life be like without homegrown tomatoes? That’s true love and homegrown tomatoes. Raymonde stands in the lobby of the hotel legs slightly apart, vaguely military, hands clasped behind her back when not stretched out in front of her punctuating her words. “You should already have the key to my front gate. You can come in and snip bunches of chives whenever you want. Laurent used to serve chopped chives fresh from my garden with the goat cheese at breakfast in the summer. You just use the key to come and go whenever you like without having to find me.” She rocks back and forth, toes to heels, heels to toes, her words animated, lively, confident, her voice oddly guttural, her words rolling around her throat before being thrust out into the world on her very Parisian accent, son accent Parigot, as my husband says. We searched high and low, through bundles of keys, odds and ends, some marked with letters or words, some unmarked, all mysterious. Until we finally came upon one with the initials RG handwritten on a blue plastic tag and guessed that it must be to Raymonde’s garden gate. Yet we didn’t go immediately. Too busy, and just slightly embarrassed to walk through the gate, into the home of one who was still a stranger. Yet we would bump into Raymonde occasionally, on the streets that run along the front and back of the hotel (as she lives nearby), at the market, as one of us was walking Marty, or she would pop into the hotel for a quick chat. And, of course, the question of “When are you coming by for chives?” would be tossed into the forefront every time. It was hard to oppose her wishes and not only because the thought of fresh chives mounded atop a slice of cool, creamy, slightly tangy goat cheese was so tempting. Raymonde has a take-charge personality, someone that you cannot say no to. She asks no questions; rather her words all come out in statements. Not quite swaggering through the streets of Chinon, she does walk with resolution and confidence as if she owns this city. Jogging along beside her, trying to match her stride for stride, she expounds on her garden, jams, life in Chinon and I can’t but like the woman. And I can’t help but want to follow her every command, for the woman speaks in commands. Raymonde is one of the cast of characters that inhabit our new life in Chinon. Each has his or her own odd quirks and distinctions, yet all are wonderful, generous folks who have made us feel welcome, feel at home as Chinonais and as owners of the Hôtel Diderot. We picked up in their hearts and in their habits where the old owners left off, evidently such an easy, smooth transition, and this story of the key and the chives is the perfect example. Raymonde just assumed that we would serve chives from her garden with the goat cheese at the hotel breakfasts as the former owners always did every summer. When we finally build up the courage to wend our way through the back streets and dare to use that key, enter into Raymonde’s personal domain, we chance upon a surprise. Standing in the street in front of a row of houses, discussing whether or not we have selected the correct gate to open with that old key, we chance upon Mme. Lainel walking towards the same gate. “Hello! Are you heading to Raymonde’s as well?” we question. “Why yes! I’ve been invited for tea!” Jean-Pierre and I hesitate; a handful of chives isn’t worth our stepping uninvited into a garden party. What bad timing on our part! But Raymonde arrives at that very moment to let Mme. Lainel in and ushers us in as well, as if we were expected, welcome guests. And we enter her garden. And it is glorious. What could have remained a mundane front yard stretching from fence to house, Raymonde has created a stretch of vegetable beauty, a jungle of vines heavy with purple and green grapes draped over trellises lining a narrow path, on each side of which are rows upon rows, a tumble of tomato plants, cabbages and lettuces, green beans and zucchini, yellow flowers peeping from the brush of green. Flowers are blooming here and there, planted with no obvious order, just a love of charm and flora. She points to the ramshackle chicken wire haven housing two new chickens which have recently replaced the two killed by a weasel yet those birds are still too shy to come see us, instead scurrying into the dark recess of their nesting area. 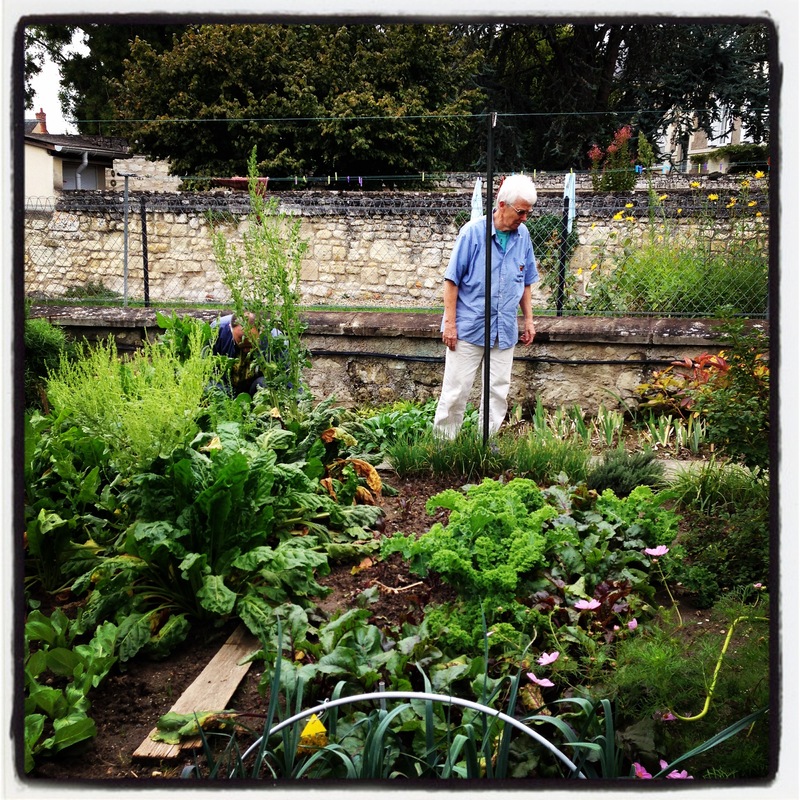 Jean-Pierre and I are utterly charmed with this garden, impressed by Raymonde’s passion and green thumb. I don’t know why we are so surprised and impressed; so many French, especially those of her generation, have a potager, a rather grand kitchen garden either in the yard surrounding their home or within short walking distance, harvesting lettuce and tomato, potatoes and green beans, feathery herbs and monumental heads of cabbage. Mme. Lainel has a large vegetable garden in her yard now tended by a hired hand, but this was simply so unexpected. This rich oasis, a garden so orderly yet bordering on wild, just filled her yard from house to fence and across again. One forgot the city outside the enclosure amidst this green, the warm sunshine, and the tranquility. Jean-Pierre and I, Mme. Lainel and Raymonde, Laurent and an old neighbor gather round an old metal table et the end of the garden, drink coca cola and nibble on Madeleines, and talk about roses and birds, gossip about Chinon, and discuss jams until my phone rings with the announcement that a group has arrived and we jump up ready to bustle out of the garden, leave this peaceful haven of green and friendship for work. But before we leave, Raymonde brings us to the far side of the garden and fills our hands – finally – with freshly cut chives heady with the scent of onions. Raymonde will pop into the hotel every now and then for a chat and the conversation will inevitably come round to gardens, ours and hers, the seasons and what we are doing with the produce coming our way, always curious about what jams I am making at the moment and who is supplying my fruit. She stands as she always does, legs slightly apart, hands clasped behind her back or waving as she speaks, always dressed in men’s trousers and button-up shirts, the pocket sometimes emblazoned with the name of a chain of carpet centers, a forest green or faded cobalt blue v-neck now that the weather has cooled. And one afternoon, as I am walking Marty, I meet Raymonde heading in the same direction. She slows her rapid stride and begins a bit of polite chitchat and then suddenly asks if I would be interested in using her green tomatoes for jam, the tomatoes that have refused to ripen to red? Would I?! Yes, indeed! Green tomato jam is a long-standing tradition at the Hôtel Diderot since Mme. Lainel was preparing breakfasts in the 1960s. I have been waiting all summer to make my first green tomato jam! “Just use your key and go on in… I don’t have to be there.” Pick all the tomatoes that are still green. And we did. And I made my first two batches of green tomato jam. A few days later, a surprise visit from Mme. Lainel and her stepdaughter asking if I would like green tomatoes for jam? They left to return with two baskets brimming with beautiful green tomatoes. I carried the first basket up to chop them and, upon returning to reception a while later, I was informed that Raymonde had stopped by and dropped off two cases of green tomatoes. And a few days later the dance was once again repeated and I found myself wading knee deep – or so it felt – in what had become a windfall of green tomatoes. And each batch is different. I made some with lemon juice and chopped candied orange peel; I made some as Mme. Lainel suggested and added an entire lemon sliced paper thin; I made batches with lemon juice, orange juice, and finely grated zest from both, and I made with just the fruit juices, sometimes tossing in more chopped candied peel. I lowered the quantity of sugar per kilo of prepared fruit with each batch. And I began placing jars of freshly made green tomato jam on the breakfast tables. And guests have singled it out as one of the best jams they tasted. After making about 50 jars of the stuff, I overheard Jean-Pierre speaking with someone on the telephone, thanking them for an offer of something yet kindly turning it down. “I took it upon myself,” he tells me afterwards, “to say no thank you and turn down another load of green tomatoes from Mme. Lainel’s stepdaughter. Was that okay?” Yes, thank you. The jars of green tomato jam that sit in the center of the breakfast tables, served to our hotel guests, are labeled « Please Love Me », these curious, romantic words never failing to intrigue. Please Love Me was a clever ruse invented by the former owner of the hotel who, upon seeing his clients reticent, refusing to taste something as odd and unlikely as jam made with tomatoes, decided to trick them into trying it. And it works. I hear the quiet discussion ensue, the questions “What is it? What could it be? Kiwi? Do you think it’s kiwi?” passed around the table as one or the other peers intently into the jar of translucid green gel subtly dotted with tiny yellow seeds. And someone will taste it and declare it mmmmm to be the best jam on the table. Apricot, peach, strawberry, rhubarb, but there is no jam quite as French as green tomato jam, confiture de tomate verte. The guests who do guess that Please Love Me is green tomato jam are invariable, unwaveringly French. And rarely tricked by the hint of orange. These French guests are always of a certain generation and each had a grandmother or grandfather who made jam for the family using fruit from the family’s potager, the kitchen garden. I will be called over to their table and showered with compliments on the green tomato jam and he or she will exclaim, “ah, green tomato jam exactly like my grandmother/grandfather made when I was little!” a smile of nostalgia lighting up his or her features. And he or she – usually he – will talk about jam because, of course, he makes jam himself. I am always struck by the fact that it almost always seems to be the man of the family who makes the jam, having learned at the knee of his grand-maman. A little apricot, sometimes peach, often strawberry and raspberry and blackberry when they grow in the garden or along the paths that surround their town or village. But the tradition of green tomato jam has been lost, which I find terribly sad. Well, I should say almost lost because my neighbors in Chinon, Mme. Lainel and Raymonde, among others, still gather the remaining, end-of-the season tomatoes that haven’t yet or have refused to ripen to red, they still gather those green tomatoes and turn them into jam. This surprising jam is a favorite of our hotel clients, many evoking memories - with a nostalgic sigh - of their grandmother's green tomato jam they ate as a child. Wash the tomatoes and pat dry. Cut into large dice, cubes or slices - I cut mine into large dice. Place the prepared fruit in a very clean bucket or recipient large enough to hold the tomatoes and the sugar. Add the juice of 1 lemon and 1 orange. Add the finely grated zest of one or both, if desired. Weigh the tomatoes and subtract the weight of the bucket/recipient to find the true total weight of fruit. As I use 600 grams sugar per kilo - 1000 grams - prepared fruit, simply multiply the weight of the tomatoes by 0.600 g to calculate the weight of the sugar needed (ex: 3 kilos tomatoes prepared = 3000 g x 0,600 = 1800 grams sugar). Measure out and weigh the sugar needed. Add the sugar to the bucket/recipient making sure that all of the tomatoes are hidden under sugar. Cover the bucket/recipient and leave to macerate at room temperature overnight up to 24 hours. Dump everything in the bucket into your copper jam basin and bring to a rolling boil over high heat, stirring often. Allow to cook for 45 minutes to 1 hour, stirring often. Lower the heat slightly if necessary to avoiding spitting or boiling over. Watch carefully as the jam can burn if left unstirred. As the jam nears the end of cooking taste and add more lemon or orange juice as desired. Add diced candied peel as desired (for about 3500 grams prepared fruit, I add about 60 grams chopped candied orange peel). The jam is ready to jar when it becomes transparent and turns a deep green then slightly amber and the bubbles will slow and thicken (the famous, slow "gloop gloop"). Lower the heat to low. Carefully ladle the jam into the pouring recipient, ideally working two jars at a time. Quickly lift off the lids of two jars, fill to the bottom of the rim where the "screw lines" begin then tightly screw on the lid and flip over onto the tray, allowing the jars to cool top down, bottom up. Fill all the jars and allow to cool to room temperature upside down. Flip top up and the jars should have all sealed. Unsealed jars should be eaten immediately. Sealed jars can be kept in a cupboard for up to one year. Once opened, I keep my jams used in the hotel for breakfast at room temperature for about a week. The jam I keep for us I store in the refrigerator. Definitely make this jam in small batches and experiment with the lemon and orange until you find the combination you love the best. I often add 2 grams - less than a teaspoon - agar-agar dissolved in a ladle or two of either the liquid released by the tomatoes during maceration, removed to a measuring cup before cooking the tomatoes, or a ladle of cool water. Stir the liquid in which the agar-agar is dissolved into the jam at the end of cooking and, stirring, allow to boil for 2 or 3 minutes before lowering the temperature and jarring. Green tomatoes are one of those lovely surprises in life you only experience if you have a garden, or friends that have gardens. Some day I will have to give it a try. I would have never tried this if it hadn’t been a long-standing tradition at the hotel. Which is why the neighbors started bringing me green tomatoes unasked! I am still fiddling with the recipe and so I would love it if you made some and told me what you added to flavor the tomatoes! LOVE green tomato jam. Don’t make it often — we don’t usually get that many green tomatoes, and there are so many other great uses for them — but it’s really good stuff. I like to add cinnamon to mine, and sometimes ginger. A bit of cayenne pepper is also a fun addition — its heat plays off the sweetness of the jam quite well. I’ve never done it, but keep thinking adding some cloves might be nice, too. John, I love the idea of adding cinnamon to green tomato jam and I’ll definitely try it. I have added cinnamon as well as gingerbread spice to various fruits for the jams and it always surprises the French! And it’s delicious! I also must try it with ginger which some Brits do. I haven’t dared add pepper to anything yet but will next year with the strawberries. I love reading about the life of a hotel baroness! The ebb and flow of your new life, while exhausting beyond words, allows all of us the ability to witness your warmth, creativity and generosity. I am so proud of you!! You are so wonderful and cute, Betsy 🙂 Thank you… you can cheer me up about this whole adventure when I am utterly exhausted which I so need! What a lovely story, Jamie, I enjoy sharing your Chinon life through your story telling – you have adapted so fast to your new life, no wonder when everybody welcomes you this way. Raymonde reminds me of my mother who had a huge garden in Andalucia and from morning till evening toiled in it, growing bitter oranges for the real marmalade, tried her luck with organic grooming of grapes (no luck as our dog would eat the grapes left on the vine when she turned her back) and would give away her produce to left and right, always having guests dropping in for dinner. 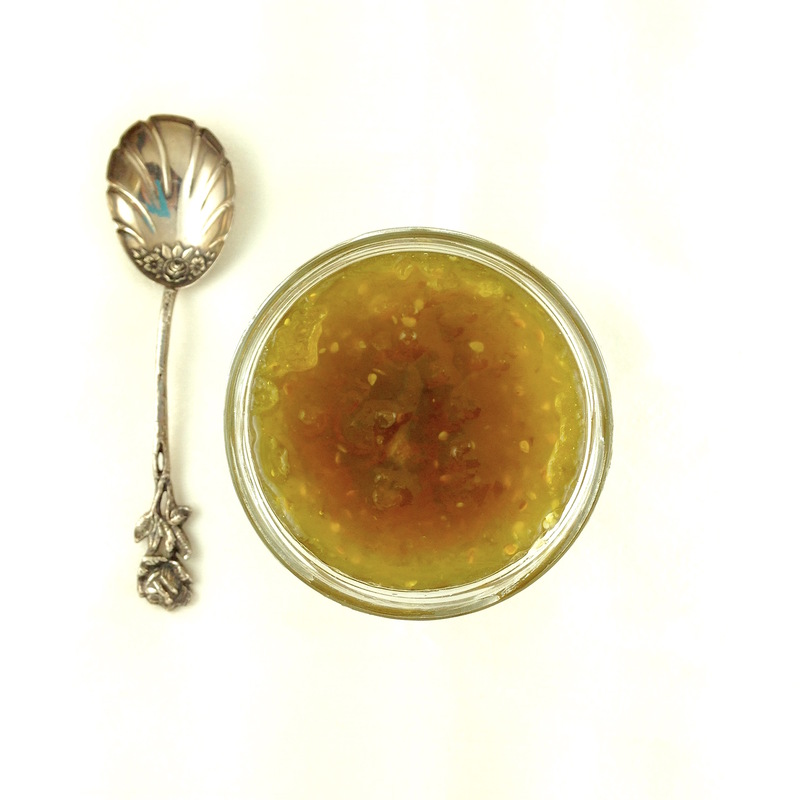 I made some green tomato jam and added freshly grated ginger to it – ever so delicious. Keep trying to subscribe to your website and it keeps saying there is an error…3 days in a row. Love your recipes! I am so intrigued with this jam, I hope to make it at the end of the season when all my green tomatoes are on the vine and the Minnesota winter is on its way. I’m curious, you mention whisking in agar, how much and when? Love your tales of the hotel. Hello Robin!! This is really such a favorite jam at the hotel! I hope you can make it! I usually whisk either 1 teaspoon or 1 packet (2 grams) agar-agar in 1/4 cup cold water then pour it into the jam at the end of cooking and let it boil for 3 minutes to activate the agar-agar. And that’s it! I have been making a green tomato chutney to serve with cheese so I tried this with some red pepper flakes to balance the sweetness. It is lovely with fresh chèvre. Thanks for the idea!